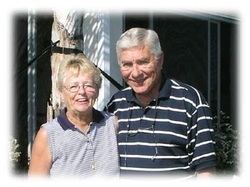 Rich and Marge have been residents of The Villages since April 2003 and they live in the Village of Briar Meadow. They are originally from New Jersey and moved to The Villages from Kokomo, In. where they spent 32 yrs. Before retiring Rich was a District Mgr. for Indiana American Water Co., Kokomo division. Marge along with her daughter owned and operated three children's resale stores in Kokomo, Muncie and Fort Wayne In. for 15 yrs. They have 5 children, 13 grandchildren, one great-grandson and a miniature schnauzer puppy named Maxwell (Max). All the children reside in Indiana, Ohio and Ill. and love to spend their vacations in The Villages.